The most widespread North American owl and the owl with the widest habitat range in the world, the great horned owl is well known to birders and non-birders alike. Large and aggressive, this owl is one of the most fearsome raptors. The great horned owl is a large, stocky bird, but like all owls, is heavily camouflaged. Recognizing its key features and field marks can help birders properly identify this owl, despite the fact that great horned owls in different ranges can be different colors. Size: 22 inches long with 50-inch wingspan, tuft "ears"
Markings: Genders are similar, though females are larger. The upperparts are finely mottled brownish-gray with checkered barring on the wings, and the slightly lighter underparts show finer horizontal barring. The oval facial disk ranges from gray to orange-rust and is outlined with a thin black border. White around the bill extends onto the chin and throat. The eyes are bright yellow with dark pupils. Plumage color varies geographically - great horned owls in Arctic tundra regions, for example, are much lighter than the darker birds found in thick forests. Markings for great horned owls are similar no matter where the birds are seen. These owls are excellent hunters and take a wide variety of prey, including small to medium-sized mammals, birds, reptiles and amphibians, depending on what is available in their range. As aggressive hunters, they may even attack other raptors, such as ospreys and peregrine falcons, especially in the nest. Like all birds of prey, great horned owls are strictly carnivorous. Great horned owls can be found in all habitats where suitable game is available, from open deserts to thick woods to swampy marshes to isolated tundras. These birds can be found year-round throughout North America except in the most extreme Arctic regions, and they are almost as widespread in South America, though not typically seen in the deepest tropical rainforests. Though they occasionally wander for hunting, great horned owls do not migrate. The great horned owl has the classic "hoot" call with a deep, strong pitch. The hooting song lasts 3-8 syllables that increase in tempo in the center of the call. Male and female birds may sing together, and females use a slightly higher pitch. Young great horned owls use raspy barks and whines to get attention. The great horned owl is fearless and aggressive, and will frequently attack prey larger and heavier than itself, including cats, skunks and porcupines. If a nesting area is threatened, these birds will even attack large dogs and other predators, including humans. They are primarily nocturnal birds and hunt from perches, where they silently watch and listen for prey before taking flight. Great horned owls are monogamous birds that begin their nesting season in the winter, often laying eggs in January or February. They typically use a nest that was originally built by a different raptor, and stick nests are preferred. The female parent will incubate the white, spherical eggs for 30-35 days, and both parents will care for the owlets for an additional 35-45 days. Only one brood, typically with 1-5 eggs, is raised annually. Birders who want to attract a great horned owl should provide large trees and protected snags for roosting or nesting, and avoid using pest control methods that would eliminate food sources such as rodents or rabbits. In many cases, however, great horned owls are seen as potentially dangerous and unwelcome guests either to pets or backyard birds. Many pet owners and birders take steps to protect their pets from the owls rather than encourage these owls to stay nearby. Because of their widespread range and adaptability to different habitats and food sources, great horned owls are not considered threatened or endangered. 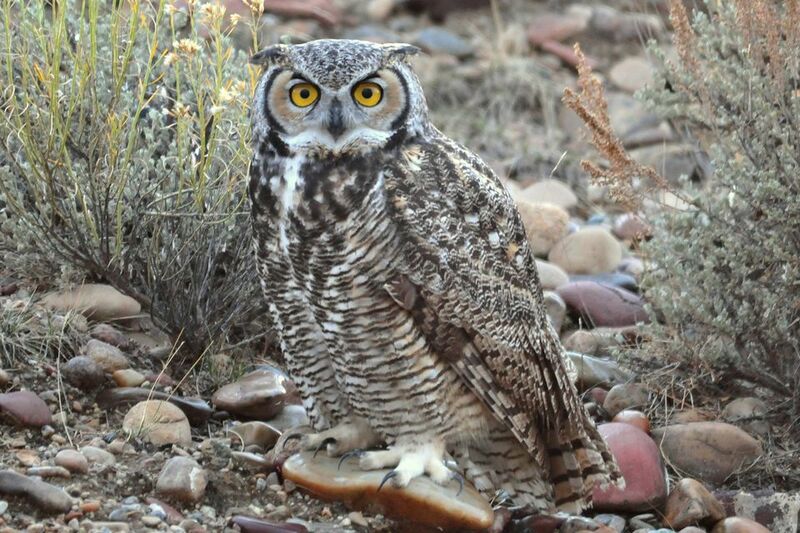 They are at risk, however, from contaminated prey where pesticides are not used appropriately, and fences and other collision hazards also threaten great horned owls.